Sometimes I just don't feel like writing up a whole big post on the books I read. Shocked, aren't you? (Doesn't Carrie always like to talk? A lot?!) Sometimes no. I don't know if it's the subject matter or just the fact that it's Christmas and we're (all of us) so busy, busy, busy. The Christmas season just doesn't seem the time for long blog posts. It also doesn't seem to be the season for much reading either. Lots to do! But I do want to remember that I read certain books and maybe list a few "take aways" for each. That shall be the point of this post. 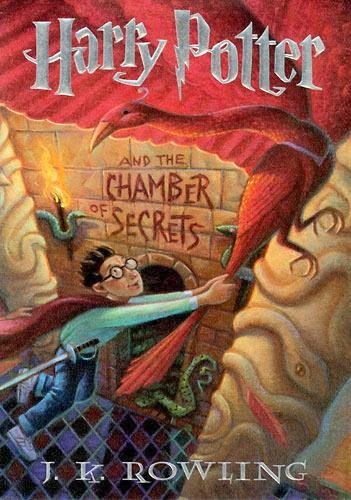 First, I read the second Harry Potter book, Harry Potter And The Chamber Of Secrets . I had read the first, Harry Potter and the Sorceror's Stone, last year. (Linked to thoughts.) When I finished the first book (and expressed my concerns with it) I wasn't sure if I would read any further into the series. But then Jonathan and I sat down to watch the first movie which I thought was a.) remarkably well done and b.) considerably less creepy and dark than the book itself felt. And, dare I say it?, I even enjoyed it. So, when I found a copy of Harry Potter And The Chamber Of Secrets I picked it up and decided to give it a read. I devoured it. It's easy, kinda "fun" reading. Which makes this an interesting series for me because, as I mentioned previously, I dislike the fact that there is not a clear black and white distinction with the magic being used. As the Queen of Carrots pointed out in her comment on my first post on Potter, the magic in these books is more technological. You can use it for good and be a good person or for ill and be a bad person. And I have concerns about that (just as much as I have concerns about the rapid technological developments we are experiencing in this modern age). I do not think we use our knowledge and abilities for good all of the time. Anyway, QOC clarified the differences between Potter and Narnia fairly well AND she gave me reason to believe that the battle of good and evil is made more clear cut in future titles of the Potter series. I liked The Chamber of Secrets for the story. I hated it for all of the ghost characters which are involved. Talking to dead people isn't something that we are advised to do in scriptures and Rowling makes it a regular practice. The way she writes her ghost characters is in a manner which is supposed to make the reader find them amusing. I just couldn't. That aspect of the book was not at all amusing to me. (I really, really disliked Moaning Myrtle.) But that said, the story as a whole was intriguing as Rowling (regardless of writing skill) does seem to have some skills in character development. I feel like I know Harry, Hermione, and Ron a little bit better through the reading of this book. Upon finishing the read, we watched the second movie. I didn't care for it as much because of Moaning Myrtle (what's with her voice even?!). Still, for the most part I thought it followed the book well enough and was considerably less spooky of a story on screen than on the page. 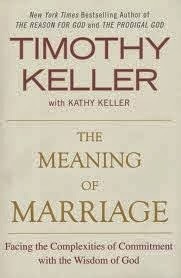 On a totally different subject I read The Meaning of Marriage , by Tim and Kathy Keller. It's not my favorite book on marriage but it isn't my least favorite either. I found it to be insightful, spot on in several instances, and generally encouraging. My biggest take-away from it was the importance of building and maintaining a friendship with your spouse. At this stage of the game (with 3 little ones) time for just each other is remarkably hard to find. It isn't easy to find childcare these days and date nights are few and far between. This fact adds stresses as you never get time away to just be and do things alone. Eventually it gets to the point where every day feels something like a game of survival in which no one is ever voted off the island. Opportunities to "work out your own salvation with fear and trembling" seem to abound. (I love my kids dearly, do not misunderstand. Ultimately, what it boils down to is that raising a family takes a great deal of intentionality!) Working on friendship IS a challenge (sometimes more than others). Important though. I confess though that while I appreciate the encouragement to build and maintain a friendship, as the Kellers aren't offering to babysit I feel about as frustrated reading the book as not, regardless of my overall like of the book. By that last statement, I should clarify that in no way do I desire to downplay the significant pro-marriage message which is this book. One of the strong points of the Keller's teaching is explaining what marriage does (joining two people together to walk a spiritual journey) and why it should not be feared. Tim Keller is a pastor of a large church in New York City which is largely comprised of singles and he has clearly learned to speak to singles about the importance of marriage and the joy of it. He is not saying it is a remarkable stress-free journey but he is also saying that it is not one that should be feared or avoided. Overall, I'd recommend this read to people who are either avoiding marriage because they are scared of it or to people who have been married for at least one year. I don't think you'll "get it" if you read it when you are engaged. It won't be half as practical when you don't really "get" what it is you are supposed to be learning and applying. On the flip side, I suppose it's a great read for any age and any season because we all have a great deal to learn about what marriage is and is not and there is always something to be improved, in either attitude or action. This is a good read. Yes, it is possible to start a series and never finish it. I've done it numerous times. Seeing Harry Potter on a post of yours almost made me gasp/laugh when I pulled up your blog this morning. :) I finally started working my way through the series via audio book. I've listened to the first two books so far. I'm surprised at how interesting they are to me. Maybe I just wasn't expecting much out of them. I guess I should watch the movies now? When HP first came out I was totally against it. Because of all the magic (wizards and such). I have not read the books. When the movies started coming out my oldest asked me to please watch the movie and I would understand that it is a good verses evil and it did not promote witch craft. Well, like you I enjoyed the movie so I consented to letting my kids read the books through. Understanding that they were teens and had a firm foundation in their faith and that they could come to mom and dad with questions that might "pop" into their minds. I have the books on my list to read although the are not a huge priority. A friend did tell me that it is clearer at the end about the good vs. evil. :) I have to admit I enjoyed HP. Nice escapist stories. Her imagination fascinates me--I could never come up with all the plot twists! !